This is one of the most spectacular sites in eastern South Dakota and western Minnesota. Back in the mid 1800s, Native Americans would use it to be able to see for miles in any direction. Also at the top of Indian Lookout there is an Ancient Indian compass formed from rock back in the mid 1800s. Do you enjoy fishing, especially trout fishing? 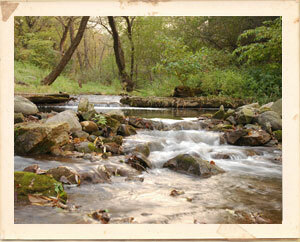 Come to Gary, SD and fish for trout in a spring fed stream. This historic creek, know as Laughing Water Creek by the native tongue is restocked on an ongoing basis for your enjoyment. There are several other lakes close by to catch other fish for your sporting enjoyment. Remember the good ole days when horses and mules did all the work? You can relive those days again. 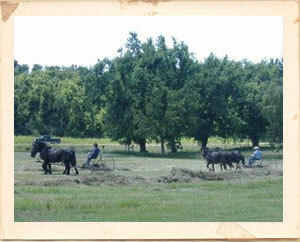 Come to historic Gary, SD on July 3 and see horse drawn machinery harvest grain; mow, rake and stack hay; and may even do some plowing. You will be glad that you took time out of your busy schedule to see these things that go back in time. The Four Moons Rising Rendezvous is a five day event always encompassing the July 4th holiday. 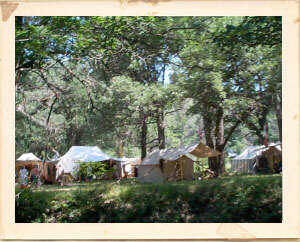 It is a pre-1840s encampment with campers living in canvas tents and cooking over the open fire and in cast iron pots. The campers attempt to relive the experience of the Fur Trade era when the trappers would come down from the mountains with their furs and trade for their next season’s supplies. Many traders would gather to offer them their yearly needs. The encampment is open to visitors on the 4th of July, or anytime if dressed in period attire. When you visit, you might see black powder shoots, archery, hawk & knife, cooking contests and other games of skill and luck, kid’s games and candy cannon. The rendezvous is located one mile west and ½ south of Gary. WOW!! 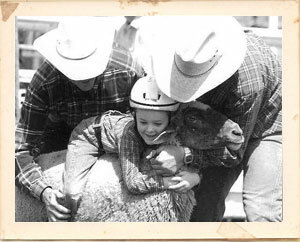 The good old days are still here for those rough and tough cowboys and girls. 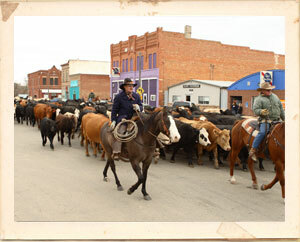 The annual rodeo still comes alive with the usual rodeo events or the games they play. Come to Gary, SD in the last days of June and see these attractions. You will be glad you stopped by. The late 1800’s were an exciting time in Dakota Territory/South Dakota. One of the topics of much discussion at the time was finding gold at the Gary Gulch. 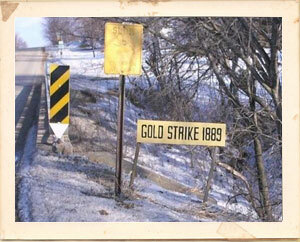 There was also another gold strike at Cobb Creek about three and a half miles south of Gary. The gold rush, circa 1889, brought a huge number of people to the area. Later, there were engineers hired to come to the area to determine if there was enough gold for a commercial operation. It was determined that there was not. To this day there are still individuals that go to the Gary Gulch area and pan for gold in Laughing Water Creek. Would you like a chance to strike it rich? Come to Gary, South Dakota and try your luck. It would be great family fun! In the late 1800’s there were several ice houses in use. Businessmen would cut ice from Talking Water Creek and store those choice blocks of ice for summer use. This one is still in existence on the west edge of town. 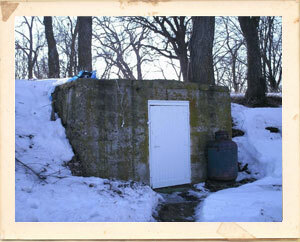 For a close up look of history stop by and ask the owners if you can take a close look at this pioneer ice house. For years there has been a rock formation at the top of Indian Lookout just a mile west of Gary, South Dakota. Through the years it was always thought to be an arrow pointing toward the Gary Gulch. In 2008, Dr. Elden Lawrence, after spending some time at the site, came to the conclusion that the formation is an Ancient Indian Compass. It has been determined that this Ancient Indian Compass was constructed at this site circa 1865, about the time that Chief Little Crow was in the area. It is defiantly a must see piece of history. 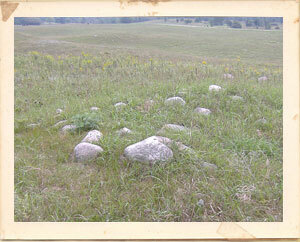 Just a mile west of Gary, South Dakota is an old burial ground. In the early history of the area, folks that had passed on were buried in this cemetery. As time went on, Native Americans were also buried there. 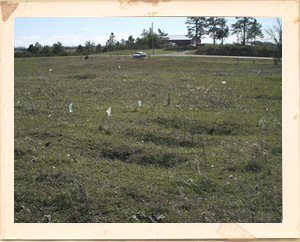 About the time frame of 1885, most of the graves were dug up and moved to the new city cemetery north of Gary. However the Native Americans that were buried there were left there. Those graves are still there today. If your enjoy history, you will want to see this site. 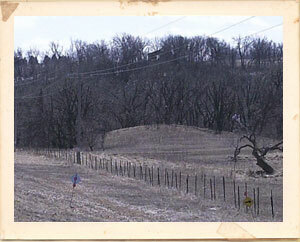 About three and a half miles to the south of Gary, South Dakota, located at Cobb Creek, there is an Indian Mound. In 2008 it was inspected by a Tribal Chief and a Director of the Upper Sioux Agency. It was determined that it is a perfect example of a “Mound with a Tail” because of the way it is built. When you come to this area, make sure you get a chance to see this rare Native American attraction. In 1973, Gary, South Dakota, one of South Dakota’s eastern most communities, placed itself on center stage in the States planning for the State Bicentennial Celebration. Gary has been designated a Historic City by the South Dakota Bicentennial Commission. This distinction recognizes its pioneer role as a major player in the western march of the 1870s and 1880s and gives the city a very important role to play three years from now when the nation and the state celebrate the United States’ 200th birthday. The Historic City designation only happened after residents of the community appeared before the commission and argued a convincing and detailed showing of Gary’s historical heritage. The spirit and determination of the group convinced the commission that it deserved the “historic city” designation. Once designated, Gary, South Dakota became the smallest community in South Dakota to be approved and one of the smallest in the entire United States. Gary satisfied the commission that it not only has the historic assets but the energy and enthusiasm to devise a program which can make it a center of interest during the bicentennial year. Work toward that objective has already begun, it has, in fact been in motion since the organization of the Gary Historical Society in 1967. Groundwork has been completed and the overall outlines have been drawn. Gary will recall the days when it was a major supply point for much of the eastern part of Dakota Territory. The Winona and St. Peter Railroad came and it was the only connection to eastern locations and played a very important part in the origins of most area communities. One of those towns was Watertown. The Lumber and other building materials for the first buildings were hauled overland from the Gary railhead in the late 1870s, and until the railroad was extended, Gary remained the focal point for supplies.